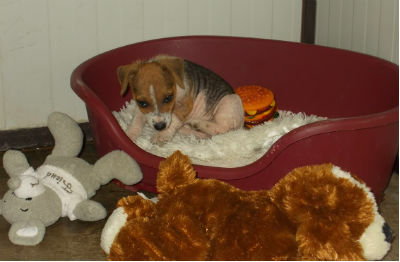 “He was soaking wet and cold, very scared and submissive and had a severe skin infection. The member of public who found him named him “Porridge” as that was the first meal he ate”. Says Helen Chittock, Manager or Lincoln Farm Rescue and Re-homing Centre for Dogs, near Bere Regis. “We immediately started treatment with Damory Veterinary Centre in Blandford and hoped that Porridge would start to feel better”. 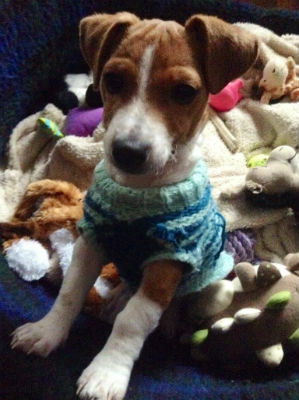 It took weeks, but, with lots of TLC from staff, Porridge started to gain confidence. “He was such a frightened little boy when he came in, but in time, he started to become more brave, then playful, and then mischievous! ­ Which is exactly what we wanted to see in a pup so young”. Porridge received the happy ending staff were hoping for when one of Damory’s veterinary nurses, Susie Pryke, fell in love with him and decided to offer him a forever home. 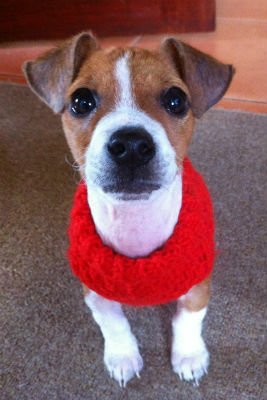 “I already have a rescue terrier called Maisie from Margaret Green Animal Rescue, who was brought in as a cruelty case. Porridge is such a playful and sweet boy and has grown so much in the short space of time he has been with us. He gets on really well with Maisie and has taught her how to play, which is delightful to see”.